This is our flagship product developed for use on greasy oily surfaces. It is totally safe to use on any surface and is a like for like replacement for harsh cleaning chemicals, being safe to use around pets and children with no harmful effects. “As a professional cleaning company, we are using this product in our customers’ homes as a replacement for chemical degreasers with fantastic results, in fact it makes our job easier.” As well as a degreaser/kitchen cleaner, it has also been developed in to a BBQ cleaner and a Patio Cleaner which is totally safe to use, the run- off even feeds the surrounding garden area! For details about this product, please contact Mum’s Helping Hands Ltd. 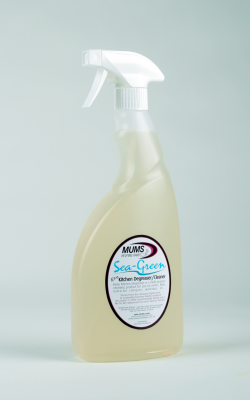 The kitchen degreaser / cleaner is available in 750ml trigger spray bottles for domestic use and 5ltr containers for trade/ commercial use. It’s ideal for: catering establishments, schools, factories, workshops etc. We can deliver directly to local traders, (minimum order applies). Technical Data Sheet. COSHH Sheets available on request.